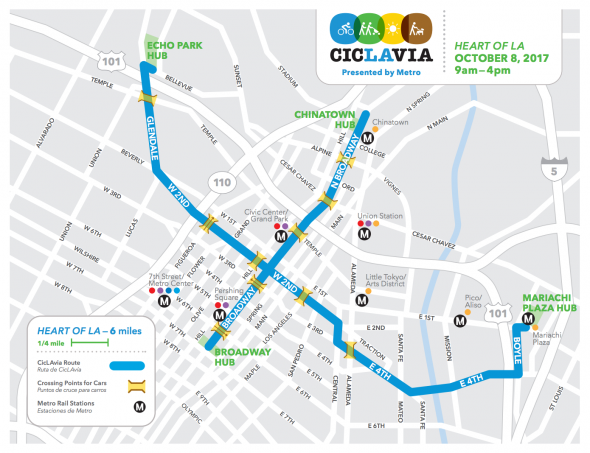 CicLAvia returns to the heart of L.A. on Sunday, Oct. 8, from 9 a.m. to 4 p.m.
As you can see, there are multiple Metro Rail stations near the route. For those coming from further away, consider taking Metrolink to Union Station. Load $3.50 in Stored Value for a roundtrip ride. For more information about detours on specific Metro Bus lines during the events, visit Metro’s Service Advisory page. For more information on routes and connections, use the Trip Planner or call 323.GO.METRO. If you’re planning to do Outdoor October — is that a thing ’cause I feel like it’s probably a thing — we have two Open Streets events to help you get rolling. First up is COAST, bringing two miles of car-free streets to Santa Monica on Sunday, Oct. 1. The free event takes place from 10 a.m. to 4 p.m. and the route travels primarily along Ocean Boulevard, Colorado Avenue and Main Street. There will be live music and performances, local food, art installations and unique areas promoting mobility, art, and sustainability. If you’re planning to attend, you can get there via the bike path along the beach as well as the bike path that runs alongside the Expo Line. Big Blue Bus is also an option; all buses have bike racks. Another viable option is, of course, the Expo Line, which runs between downtown Los Angeles and downtown SaMo. Since Coast is a short route, you might not think it worthwhile to schlep your own bike to Santa Monica, and that’s totally fine. The two-mile route is a very comfortable walk. And you can always pick up a bike along the way. Consider Breeze Bike Share, which has stations at 26th St/Bergamot Station, 17th St/SMC Station and Downtown Santa Monica. Rent a bike from Santa Monica Bike Center, located a block southwest from Downtown Santa Monica Station. Or try Metro Bike Share: there are stations adjacent to the Expo Line at 17th St/SMC and Downtown Santa Monica Station and more stations in Venice which is just a short ride away. Right after COAST, CicLAvia will return to the heart of L.A. on Sunday, Oct. 8, from 9 a.m. to 4 p.m.